Same features as the 'Classic' panniers but smaller and without additional outer compartment. Inner lid compartment with zipper and little extra pouch for rain cover. The symmetrical shape allows you to use the bag both on the right and left side. Includes Universal rail with adjustable hook position for standard carriers Ø 8/10/12mm. Available only in pairs. 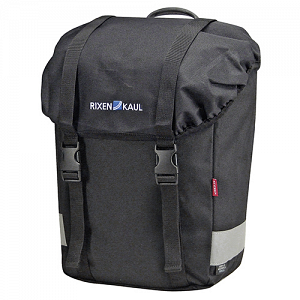 This bag can also be used as a small pannier on self-supporting carriers or kids' bikes. The lower catch prevents the bag from swinging sideways. The 16mm/Kettler hook is not included for the lowrider bag.